[Giveaway Games] ProgramyZaDarmo 10th Anniversary Celebration! Just post your comments, you may wish ProgramyZaDarmo on its 10th Anniversary. There are 20 games. There will be 20 winners. 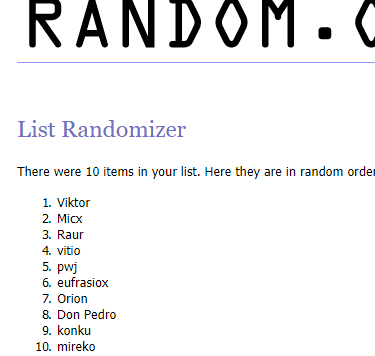 The 1st winner will be the 10th entry in the random list. He/She will be the 1st to choose his/her win/game from the list of games too. The other 19 winners, Top 1-20 entries in the random list (excluding 10th entry) too will choose their win/game from the list of games. After winners announcement, the winners replying first along with the game name in this thread will get that game. The winner should check the other winners replies before him/her to know the game he/she wants is already taken or not by any winner. The winners should claim the win/reply in this thread within 20 hours of the result announcement or new winners will be selected from the random list. The result will be announced on 10th Feb 2019 in the 2nd post in this thread. I will inform 3 hours prior to the result announcement in this thread. You may PM me for any queries. I will post the reply in the 2nd post in this thread. The license should work fine. In case of a bad license, I cannot promise but I will try to give a replacement or new game. I reserve the right of final decision in case of disputes. Please check the giveaway details "Winners Of The Giveaway" to claim the win. Bardzo miła inicjatywa związana z konkursami, w których możemy wygrać popularne gry. Very nice initiative related to contests, where we can win popular games. Dziękuję za konkurs! Życzę PZD dalszego pomyślnego rozwoju, mało spamu, dużo konkretnych postów, kontrolowanych oftopików i pomocnych userów! Thank you for the popular games giveaway! Happy 10th anniversary PZD ay Count me in! Dzięki za konkurs, życzę PZD co najmniej kolejnych 10 lat a najlepiej by funkcjonowało "do końca świata i o jeden dzień dłuzej"
Dzięki! Świetny sposób na świętowanie. Wszystkiego najlepszego, 100 lat i 100 kolejnych! Świetnie! Bardzo miło z Waszej strony. Congratulations on developing such a great forum that has been functioning for 10 years. I wish you many more great decades to celebrate. I will announce the result in 3 hours. You may participate until then.